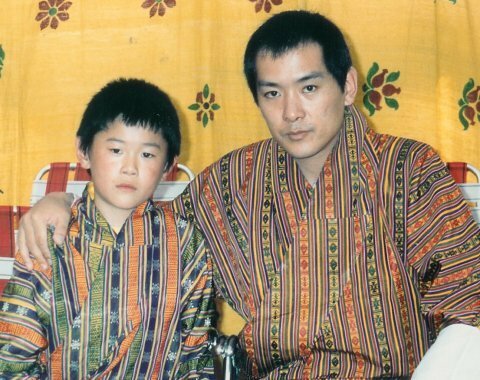 ブータン政府で首相フェローとして働いた日本人のブログ。Bhutan Blog by a Japanese worked as Bhutan Prime Minister's Fellow. I was featured in one of the biggest Japanese newspaper, Asahi Shimbun, which sells 7.7 million copies. Isn't is astonishing to know that the number of prints is about 11 times of Bhutanese population (700,000)? Here is the translation in English as requested by my friends in Bhutan and abroad. "Changing his career from a businessman to Bhutan's Prime Minister's Fellow"
"I won't live a life that I would have regretted when I die." 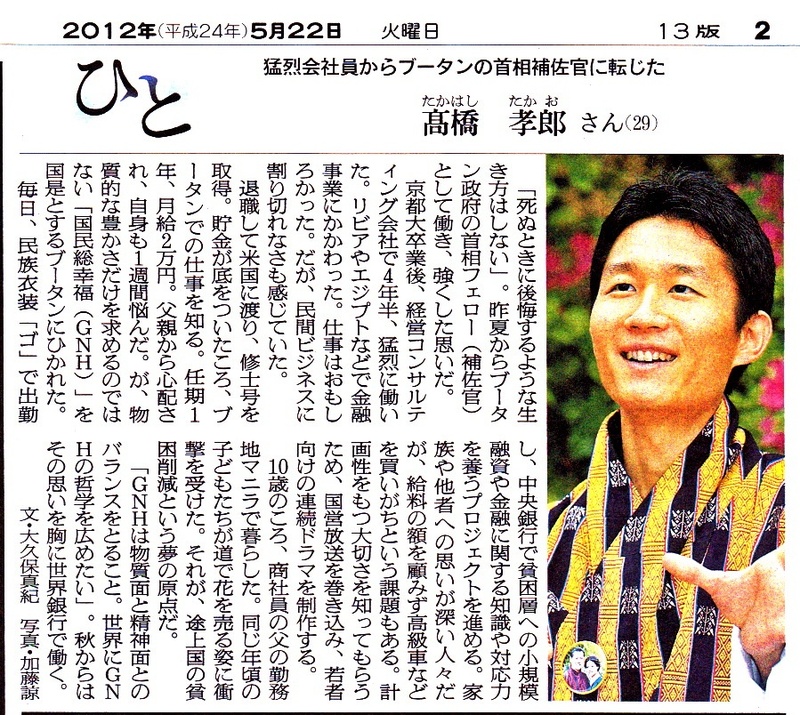 This is the conviction Takao Takahashi acquired through his experience to work in Bhutan as Prime Minister's Fellow. After receiving the bachelor degree of Law from Kyoto University, Takao worked like crazy for a management consulting company, McKinsey, for 4 and a half years. He focused on financial sector projects in countries such as Libya and Egypt. The work was interesting, but he was questioning the business world without much contribution to the social impact. He quit the company and went to the US to study Development through Master of Science in Foreign Service from Georgetown University. 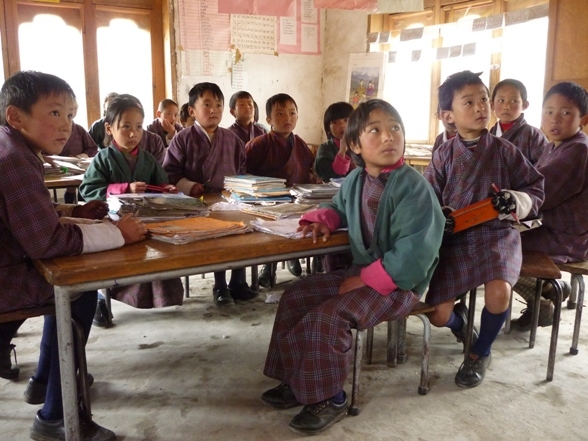 When his savings were evaporating by tuition, he got to know the opportunity to work in Bhutan. The term is for 1 year with the salary of USD 250 a month (12,500 Bhutanese Ngultrum). His father worried about his financial situation and he himself debated for a week. However, he couldn't resit the opportunity to work for a country he has been interested in for its goal of GNH (Gross National Happiness). Takao goes to work in the Bhutanese traditional cloth, Gho, every day. He is working for RMA (Royal Monetary Authority), the Central Bank of Bhutan, to promote Financial Inclusion for the poor people through various interventions such as Microfinance, Mobile phone Banking, and Financial Literacy Program. 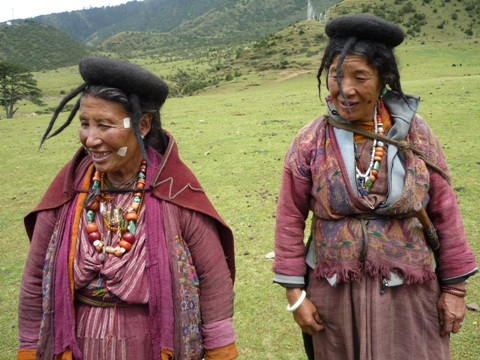 Bhutanese people are very kind and caring to others, but when it comes to money, they tend to go for an expensive car and luxury items without much care for their income level. To teach the importance of financial planning, he is developing a TV serial to raise awareness of people especially among the youth. When he was 10 years old, he lived in Manila, the Philippines, because of his father's job in import/export promotion. Takao was shocked to see children his age were selling flowers on the street without going to a school. That's when he started pursuing his dream in poverty alleviation. "Gross National Happiness is how to balance between material and spiritual well-being. I want to spread the philosophy of GNH to the world." With such an aspiration in his heart, he will start working for IFC in the World Bank Group from September. The trigger for the article was a Japanese magazine called Courrier Japon. I liked one of the interviews of a Japanese woman my age, Eriko Yamaguchi, who started her social enterprise ("Mother House") to manufacture bags and clothes in Bangladesh and Nepal with the purpose of poverty alleviation. In Twitter, I tweeted "I wish if Mother House considered setting up a factory in Bhutan." Then I got a reply immediately from Courrier Japon, saying "The editor who interviewed Eriko Yamaguchi will visit Bhutan tomorrow." The editor was visiting Bhutan to cover the visit of Dr. Agnes Chan, a UNICEF Goodwill Ambassador who supports the Japan Committee for UNICEF. There were several reporters accompanying Dr. Agnes. One of them was the reporter from the newspaper, Asahi Shimbun. The reporter got interested in not only my work in Bhutan but also my life and career. That's why she proposed to cover me in the article. It was such an honor to be covered by the well-known newspaper. A lot of friend and relatives told me that the article inspired them. I will continue doing my best to contribute to Bhutan and the world. The first moment I got interested in Bhutan was about GNH, Gross National Happiness. Then a book written by Mieko Nishimizu, a former Vice President of the World Bank for South Asia, stimulated my interest even more. She just published a new book written in Japanese, "To a leader in yourself" (by my translation). Not many people know that Japan was the recipient country of the World Bank's aid after the World War II. For example, the famous bullet train in Japan was financed by the World Bank. As a huge organization, there is no wonder why the World Bank became bureaucratic. The book describes Mieko's effort to reform the organization and change the behavior s of staff toward poverty alleviation. There are a lot of descriptions about the leadership of the 4th King of Bhutan as Mieko had meaningful interactions with His Majesty from heart to heart. (幼い第5代国王と、第4代国王。The young 5th King and the 4th King. Mieko's leadership is distinctive in a sense that she shares everything with her team, including her failures, weaknesses, and emotions. Because her words are truly sincere, she gains trust from people even who were originally against the reform. She says " A true leader has his/her brain and heart connected." Her leadership style is exactly what I learned about leadership from McKinsey, a global consulting firm I worked for. You need to disclose yourself if you want to gain trust from your client and team members. But it requires a lot of courage. She also expresses her concerns on Japan, where it's been long since leaders lost the trust from their people. For example, women empowerment is still very low in Japan. You rarely see female politicians or management at top companies. She says it's not sufficient to improve working conditions for women. Companies need to improve the benefit and facilities for both women and men since fathers should also be engaged in raising children. People should be happy at both home and workplace, which reminds me the situation of my Bhutanese colleagues. I like the title, "To a leader in yourself." It resonates with the words of my Boss, the Secretary of GNHC (Gross National Happiness Commission). The Secretary told me that the goal of education is to form a society where every individual commits to his/her own leadership. 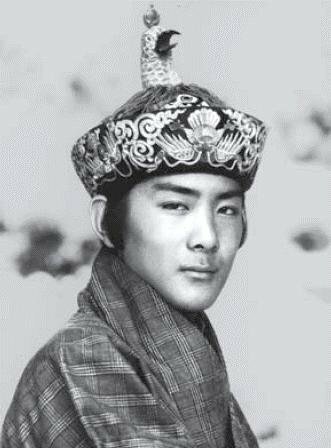 Bhutan as a monarchy until 2008 relied much on the King's leadership. Now democracy started, so the individuals need to stand up. When the massive earthquake and Tsunami occurred in Japan last year, I expected the Japanese politics to change. Unfortunately, the reform didn't happen at all. But hearing the words of the Secretary, I realized that I was irresponsible to expect someone to change Japan. I need to show my leadership to change my own country even if impact I can make is tiny to start with. I never met Mieko in person, but she gives me candid advice as she got to know me through this Bhutan blog. Royalties she would gain are all donated to the NGO, Tarayana Foundation in Bhutan. The money is used for education of poor children. I deal with Tarayana Foundation for my microfinance project. The NGO is one of the most respected organizations in Bhutan for its sincere work dedicated to the poor people. The Secretary General of Tarayana told me that the royalties from Mieko's book help funding of the NGO significantly. Royalties from Mieko's previous book were donated to a Japanese NGO for disaster relief. My next career step is to work for IFC, International Finance Corporation, in the World Bank Group. I'm excited to work for the World Bank Group which Mieko once worked for. I will do my best to be a leader whose brain and heart are connected. By the way, the government of Bhutan is looking for the next Prime Minister's Fellow after me. Why don't you check the details out from the link? You can also check out my blog on the Prime Minister's Fellowship. copyright © Appreciate Happiness ブータン・ブログ All Rights Reserved.